The Southbank Centre is the manager of a 21 acre site on the South Bank which encompasses multiple venues; the Royal Festival Hall, the Queen Elizabeth Hall, the Hayward Gallery, the Purcell Room, the Saison Poetry Library, Jubilee Gardens, and The Queen’s Walk. This makes the Southbank Centre the largest centre for the arts in Europe. The history of the Centre begins in 1951, the year of the Festival of Britain. The festival was a showcase of technology, arts, and design, and ran for many months. When the festival finished, most of the buildings were dismantled. Only the Royal Festival Hall remained. Additional concert halls began construction in 1955, and the hall was extended in the early 1960’s. Throughout the rest of the decade, more arts venues would be opened to the public. 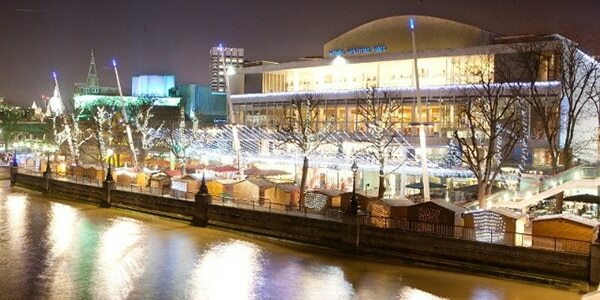 In 1986, the Greater London Council was abolished, and control of the concert halls was given to the South Bank Board. After the board took control of the Hayward Gallery the following, the venues became known collectively as the South Bank Centre. Up to present day, the Centre has been renovated, updated, and improved. The programme of the Centre includes performances from its 4 resident orchestras (The London Philharmonic, the Philharmonia, the London Sinfonietta, and the Orchestra of the Age of Enlightenment), as well as contemporary music, exhibitions, spoken word, and lectures.